To see the original requirements, Click here. Develop and implement a plan that attempts to reduce your family's water usage. As a family, discuss water usage. To aid in your discussion, if past water bills are available, you may choose to examine a few. As a family, choose three ways to help reduce water consumption. Implement those ideas for one month. share what you learn with your counselor, and tell how you think your plan affected your family's water usage. Using a diagram you have created, explain to your counselor how your household gets its clean water from a natural source and what happens with the water after you use it. Include water that goes down the kitchen, bathroom, and laundry drains, and any runoff from watering the yard or washing the car. Tell two ways to preserve your family's access to clean water in the future. With your parent's permission and your counselor's approval, interview a local architect, engineer, contractor, or building materials supplier. Find out the factors that are considered when using sustainable materials in renovating or building a home. Share what you learn with your counselor. 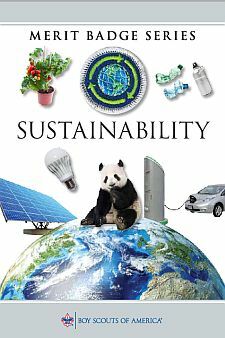 Learn about the sustainability of different energy sources, including fossil fuels, solar, wind, nuclear, hydropower, and geothermal. Find out how the production and consumption of each of these energy sources affects the environment and what the term "carbon footprint" means. Discuss what you learn with your counselor, and explain how you think your family can reduce its carbon footprint. Develop and implement a plan that attempts to reduce consumption for one of your family's household utilities. Examine your family's bills for that utility reflecting usage for three months (past or current). As a family, choose three ways to help reduce consumption and be a better steward of this resource. Implement those ideas for one month. Share what you learn with your counselor, and tell how your plan affected your family's usage. Evaluate your family's fuel and transportation usage. Review your family's transportation-related bills (gasoline, diesel, electric, public transportation, etc.) reflecting usage for three months (past or current). As a family, choose three ways to help reduce consumption and be a better steward of this resource. Implement those ideas for one month. Share what you learn with your counselor, and tell how your plan affected your family's transportation habits. Keep a log of the "stuff" your family purchases (excluding food items) for two weeks. In your log, categorize each purchase as an essential need (such as soap) or a desirable want (such as a DVD). Share what you learn with your counselor. Plan a project that involves the participation of your family to identify the "stuff" your family no longer needs. Complete your project by donating, repurposing, or recycling these items. Discuss with your counselor how having too much "stuff" affects you, your family, and your community. Include the following: the financial impact, time spent, maintenance, health, storage, and waste. Include in your discussion the practices that can be used to avoid accumulating too much "stuff." World population. Learn how the world's population affects the sustainability of Earth. Discuss three human activities that may contribute to putting Earth at risk, now and in the future.